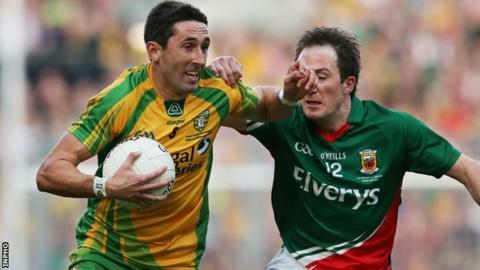 All-Ireland winning midfielder Rory Kavanagh has re-joined the Donegal football panel and will be part of manager Rory Gallagher's 2016 plans. The St Eunan's man stepped down from inter-county football last January, citing work and family considerations. It is understood that the 33-year-old has met with Gallagher and is set to join collective squad training. Kavanagh won three Ulster titles, a 2012 All-Ireland medal and a National League crown under Jim McGuinness. The Letterkenny man has worn the county colours on 132 occasions, with the last of his 49 championship appearances coming in the 2014 All-Ireland final defeat to Kerry. The high point of his career so far was winning the Sam Maguire Cup in 2012 thanks to a victory over Mayo, a triumph which came 10 years after he made his Ulster SFc debut. Gallagher's first year in charge in 2015 yielded an Ulster final appearance against Monaghan, before an All-Ireland quarter-final reverse at the hands of Mayo. Donegal will open their Football League campaign with a Division One game against Down on Saturday 30 January.